Part of Culinaire’s elevator pitch is that we are a food and beverage magazine tempting taste buds, engaging appetites, and celebrating Alberta’s cuisine. We highlight local people and learn from their experiences and success. The article we have chosen to represent us is from our January/February 2018 issue, timed to be relevant for Valentine’s Day. Our aim is to educate, inform, and entertain, and in this article we feel we’ve achieved our goals. 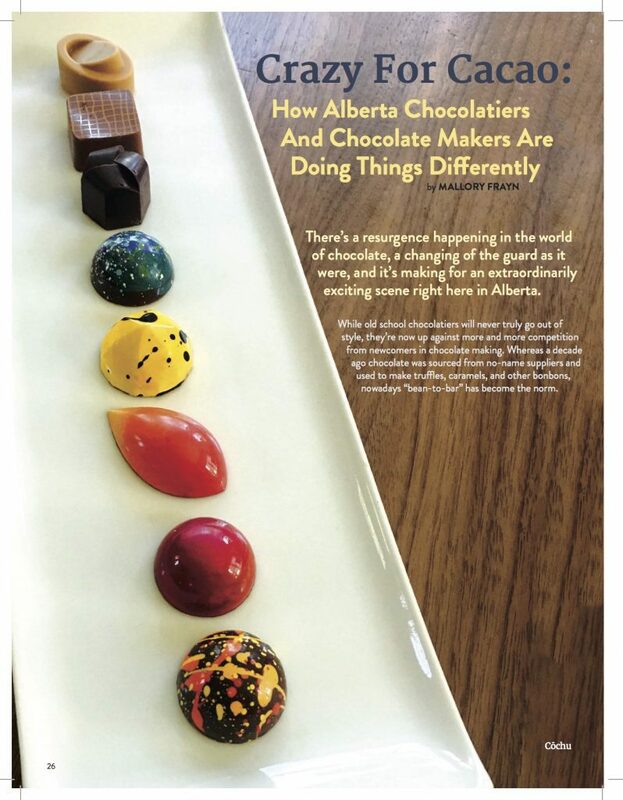 We’re celebrating the resurgence of creativity and innovation in the world of chocolate, and showcasing the new ideas and success of lesser-known as well as more established chocolatiers in Alberta who are pushing boundaries. We wanted to consider the raw ingredients in chocolate making, and to bring to light the people to whom this matters, giving them a platform to voice their philosophy on ethical sourcing.